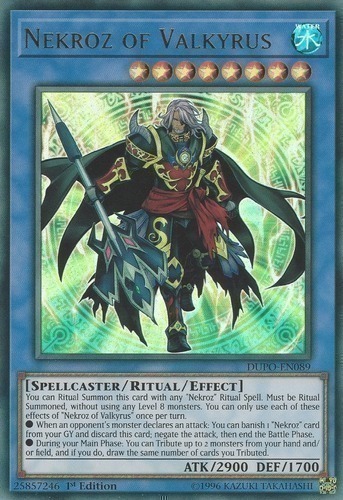 You can Ritual Summon this card with any "Nekroz" Ritual Spell. Must be Ritual Summoned, without using any Level 8 monsters. You can only use each of these effects of "Nekroz of Valkyrus" once per turn. ● When an opponent's monster declares an attack: You can banish 1 "Nekroz" card from your GY and discard this card; negate the attack, then end the Battle Phase. ● During your Main Phase: You can Tribute up to 2 monsters from your hand and/or field, and if you do, draw the same number of cards you Tributed.